SupplySide West brings together more than 17,000 ingredient buyers and suppliers from the dietary supplement, beverage, functional food, personal care and sports nutrition industries. SupplySide West is all about the science and strategy around the development of finished products that drive the global business economy. 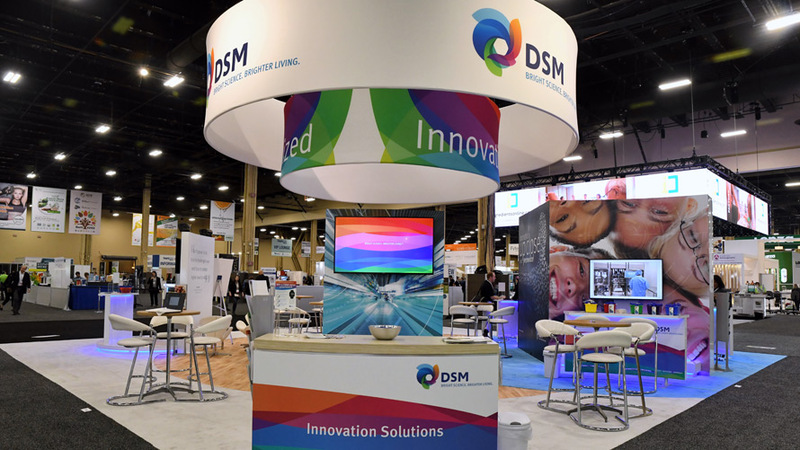 DSM came to us with the challenge of creating a new open plan that would also allow for partners MixFit, Inc., Tespo, and Panaceutics Nutrition to join their booth space. 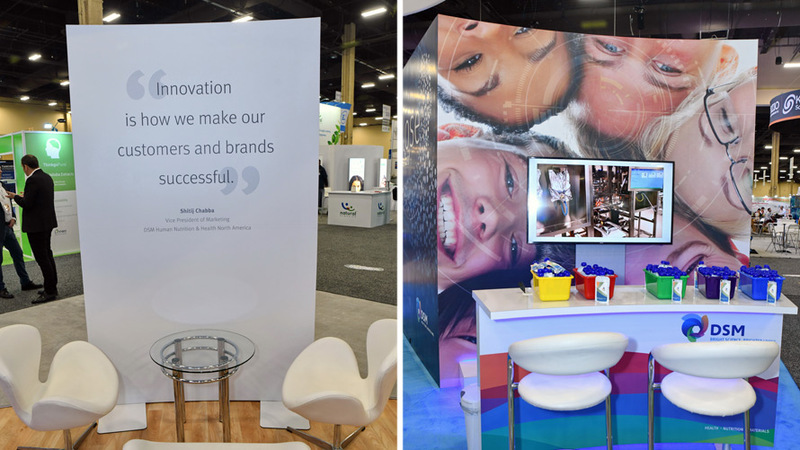 With 1600 square feet to fill, we designed a custom exhibit to fit their needs while also providing their partners with private areas for face-to-face marketing with attendees. The overall visuals of the exhibit were bright colorful and had a lot of motion with a rotating hanging sign and videos throughout. DSM was able to attract attendees with product samples, machine demos, and live presentations in their space. Attendees could try custom vitamin drink samples, flavored gels, and food puree pouches as well as watch new machines with the ability to dispense your daily vitamins into water or check out a real time, nutrient delivery system that fits your daily needs. You could also check your antioxidant levels in your skin using their Biozoom display to find out what may be lacking in your diet.